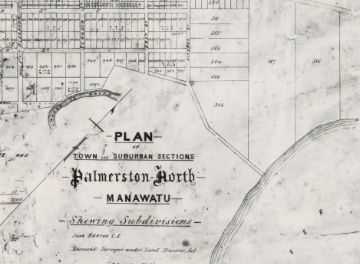 When surveyors laid out the Manawatu town of Palmerston North, they were a little optimistic. An 1878 [see left] and later 1895 survey map shows sections in the suburbs of Terrace End and low-lying Hokowhitu running right up to – and in some cases beyond – the banks of the meandering Manawatu River. However, the multitude of lagoons in the district showed that the Manawatu River must have flooded, and changed its course, many times throughout the centuries, leaving these “cut-off meander” lagoons as evidence. And so it was perhaps inevitable, that as soon as homes and farms were established around its course, they were periodically inundated by floods, particularly in the spring. Floods only seemed to become more frequent and more destructive after bush from nearby hills was cut down and burnt, clogging up rivers with debris, and reducing the capacity of the land to absorb heavy rain. But while the floods were generally seen as a destructive force, they also led to some revelations – sometimes of the most momentous kind. This was the case with the flood of August 13, 1912. 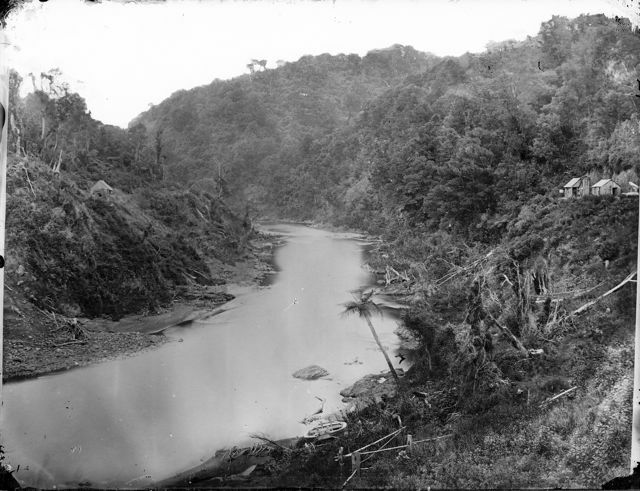 Not far from the site of Mr Snow’s now vanished house, the flood had scoured out the sand and top soil of the banks of the Manawatu River, exposing an outcrop of old and hardened blue clay. 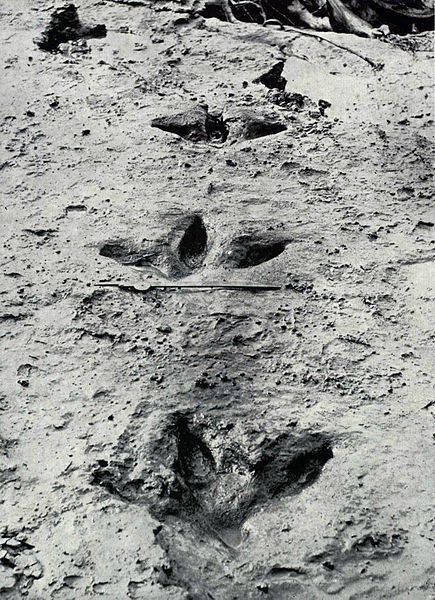 It was here that G. E. Coles, a young Welshman with a keen interest in things prehistoric, discovered the indentations of four large* moa footprints. Mr Coles, reported his find to the Manawatu Philosophical Society and the secretary, Mr Kenneth Wilson, later made a report on the find to the the Society, which was included, along with the photo left, in the Transactions and Proceedings of the Royal Society of New Zealand [click here to view his report]. The footprints were carefully cut out and deposited in the Dominion Museum, where – presumably – they remain today. A concrete cast is held at Te Manawa, the Manawatu Museum [click here to view image]. A photo of Mr Cole with the prints in situ can be viewed here (Mr Cole is on the left). It is also reproduced in Charlotte E. Warburton’s “Changing Days and Changing Ways”, published 1954. * “Large” is not mere literary license. The prints were measured at 18 inches across the width of the toes – almost half a metre! Next Article When did the moa become extinct? Very interesting indeed: a positive outcome of a flood. What a pity they didn’t keep the whole track intact…an amazing find anyway!